These realistic animal tokens can be found individually at Top Shelf Gamer (US) and Board Game Extras (Europe), as well as other retailers. These tokens are available through Top Shelf Gamer (US) and Board Game Extras (Europe). Ha ha…you’re right about that! I can’t think of any games that have cat tokens, though. Hot Tin Roof. Unfortunately, they’re in unique pairs, per player. would require a lot of sculpts or paint jobs. Honestly I still would love cat meeples. I can substitute them for something else. I can think of several- I’m looking for cat figures for a PnP right now and could only dream of Stonemaier tokens for them! Let’s keep feedback constructive here, as the sculptor reads these comments. What specifically about the eyes makes you not a fan? I would agree, the horse and sheep have eyes that are too human like. They should be further apart for both and a bit further up the face for a horse. Great looking sculpts though based on how small they must be. Yes, I asked my GF who is a massive animal geek and she says (and I agree) that on the realistic versions the eyes of the horses, sheep and cows, plus a little with the pigs should be more on the side of the head. Prey animals tend to have their eyes more on the side of their heads so they can see most of the way around themselves to keep alert for predators, whereas predators tend to have them on the front for better depth-perception. Then make a game that includes cat tokens. If the sculptor reads these comments let me say i really love the treasure sets :) I think it must be crazy creating these for such a small scale! What games are these targeting? I’m rather confused why animals are a good choice for the next chest. These are fantastic. If we’re doing animal tokens, though, they have to work with any game from the king of farming games, Uwe Rosenberg. That means we need donkeys for Caverna. A simple solution would be using the horse sculpt and painting it gray. Donkeys also need longer ears. I would be thrilled to have them for Finca as well. Eyes on sheep and cow should be more of like dog’s. And eyes on horse needs to be higher on head and also be like dog’s. Jamey, I’m going email you an edited picture of this. Something that struck me right off is the scale. It is disconcerting having a pig the size of a horse or cow even bigger than a sheep! I think some idea of scale needs to be considered even if they may not be used together in the same game. If you were using them in a game together then it really would be a bit weird. I realise they can be to actual scale but making the pig smaller than say the sheep would be a good idea. Likewise with the dog – smaller than the sheep. And the sheep somewhere bigger than a pig but smaller than a horse. Sorry – mucked up there – I do realise that they “can’t” be to actual scale… Autocorrected to “can” which is totally different and not my point. Yes, MUST HAVE Donkeys for Caverna!!! I love these! I would insta-purchase these. Neat idea, I’d be a bit concerned that the legs would snap off easily if the bits are stored together and are jostled, or are simply mishandled. Would have liked to have seen something other than a dog in this pack since i don’t think many games have a use for 10+ dogs. Other than that, I think these would look pretty good at scale since they’re not much bigger than other treasure chest bits. Is there some ideas for the possible horror chest? Love something to use for Study in Emerald. Chris: Yep, we’re currently working on the horror chest (see here: https://docs.google.com/spreadsheets/d/1CeIwkPr3NnbU9DeySmztlhxoOhL9E6nvrepkrYzr9Xg/edit#gid=1305296880). Which tokens does Study in Emerald use? I agree with other opinions that we need a donkey for Caverna, but we also need a wild boar for that game. I love these sculpts, except I also agree that the pig needs to be smaller, or shorter. I can’t wait to purchase these! Just wondering, what are the size of these? It’s hard to tell from the picture. Are they roughly the same as the resources from previous treasure chests? Matt: Yes, they’re roughly the same size as the original tokens. Would love for an option for a donkey instead of a horse for Caverna love the look of these! I love these tokens! I think a different paint-job on the pig could make it more into a boar-pig. Something brown, or brown spotted. Any thoughts on maybe a mule? (Basically a horse with big ears.) That could cover both horse and donkey. Lastly why a dog and not a goat? I could be showing ignorance, but I don’t know of a game that would use a dog token. Love all the work you do, can’t wait for more. Some camels for Voyages of Marco Polo would be great! Marco Polo Expedition (different game than Voyages) also uses camels, although they’re different colors to denote different players. There are at least two other games using camels but calling them popular would be a stretch. And I can’t remember what they are. Samarkand uses lots of camels and deserves way more love than it gets. Also, Five Tribes. Ah, yes, Samarkand was one of the ones I was thinking about. There’s another one which is a deduction game in which camel caravans are subjected to nighttime thievery. Camel Up. Camel Up: The Card Game. Totes Kidding, by the way. We haven’t made them yet. :) We’ll announce a pre-order later this year via our e-newsletter. The following game/exp. uses camels (Across the Desert) and expansion (Catan Traders and Barbarians). How about a Reed resource in the future? 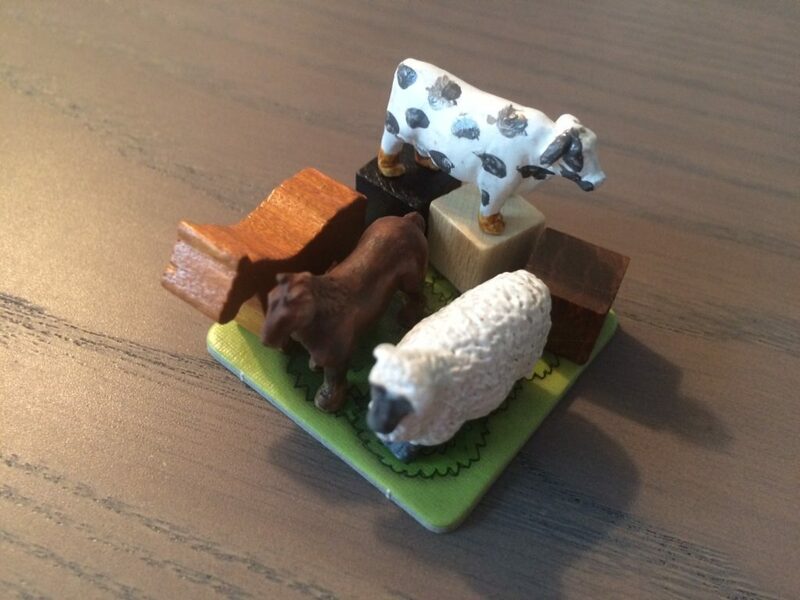 For Agricola and All Creatures Big and Small, you’ve every resource (and soon to have every animal) covered except the reed. The completionist in me wants reed! And if it’s generic enough it could double as a wheat resource for other games. Just sayin’. Duncan: Yep, reed is coming up in our next set of chests (after the Token Trilogy)! :) We already have wheat, though. Brilliant! You’re a genius, sir. Lots of games use camels. Oasis, Catan: Traders & Barbarians, Sahara… I don’t know how popular these are, though. …if you build it they will come. The Voyages of Marco Polo! These look amazing, I am a little confused on what will be the final size of these animals … in the picture it looks like two different sizes for each. Both sizes will be included in the animal chest. Will you be reprinting the other resource kits when you do this one? While in the abstract I would pick “cutesy” over “realistic” because “realistic” would make me feel like playing with toys rather than a board game… in the case of YOUR tokens, the pics you’ve shown, I prefer the “realistic” ones. Partially because you’ve done a good job making the realistic ones just a little bit cartoony. I like that. They’re not TOO real. Also, I love the scale – you can fit so many of them in the allocated areas of an Agicola board, for example. Looking forward to this treasure chest! Out of interest, what do you sub the crates for in Agricola? Ah, I see from the comments you’re doing what I was next wondering about – a straw type one for the reeds in Agricola. Damn you and your e-vil money extracting schemes! Phil: I use crates for reed in Agricola (we have grain but not reed). I saw your post on FB, awesome! Looking forward to these. Are you still thinking of larger ones to represent multiples, along with the smaller? Or just smaller? We looked at both the larger and smaller versions, and we decided to just make the larger versions. My one nit-pick on the new photos is the spots on the cow. They all have a weird little pointy part that doesn’t look realistic, it looks like an artifact of how the spots were applied – especially since it seems like all the spots have that. I liked the spots better in the earlier prototype photos. Hopefully the “spots” will be improved for the final product. Looking forward to using these in Agricola! I agree about the need for a donkey. Painting the horses grey just wouldn’t be the same – they’d just be grey horses. A donkey would have longer ears and the mane would be different. Great idea! I was excited when I saw this. Was there a pre-order for an Animal Treasure Chest? I noticed at Top Shelf Gamer they have pre-orders for “sets of 10” of four different animal types with a release date of early December. I don’t recall a pre-order notice in any of the newsletters, but maybe I missed it? Mark: Indeed, they just launched the pre-order recently, and I’ll share it on our upcoming e-newsletter. All of the animal tokens we’re currently making are already in production (no donkeys). So will these be sold in a chest or will they only be sold separate like Top Shelf has done? Also will there be a Canadian friendly retailer for them? They’ll be sold separately, not as a full chest. Any retailer can buy the tokens from Top Shelf Gamer at a retail discount, so if you want them, just tell your preferred retailer. The boxes are beautiful and I love how they look on the shelf. There’s no chance they will be included in a future Treasure Chest? I’m sure customers would be happy to support an animal chest via KS, no? Sorry Sean, there’s no chance. We no longer use Kickstarter, and Kickstarter is used to create something new—we’ve already made the animal tokens, and they’re available for you to buy today. I picked up a bunch of animal tokens from Top Shelf Gamers, and they are awesome! We played Agricola All Creatures with them and had a great time. The sheep are my favorite, love the wool texture. And the cow spots I’m much happier with for the final production, they got rid of that ‘pointy’ artifact in the prototype pics. My only regret is that they don’t sell the dog piecemeal. I don’t have any games that need 10 dogs. But I have several games where for thematic fluff it would be cool to have a single dog, I would’ve bought just one (along with my ~$60 order of all the other animals!). This is Chad from Top Shelf Gamer. Great to hear about your experiences with your tricked out Agricola! We have soon-to-be-released game bundles for the Stonemaier tokens. What games do you see needing one (or a few) dogs? On our radar we’ve got Robinson Crusoe (1 dog), Betrayal at House on the Hill (1 dog), and Caverna (20 dogs). Please let us know about any other games and we will work to make it happen. I just wanted to let you know that we heard your need and Top Shelf Gamer now has single Dog tokens available for purchase.